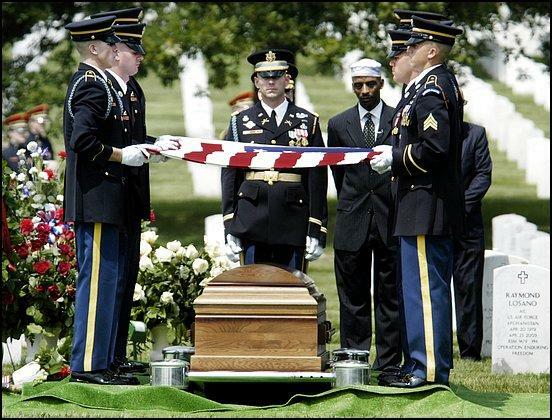 Captain Humayun Saqib Muazzam Khan (September 9, 1976 – June 8, 2004)] was an American soldier who was killed in Iraq during Operation Iraqi Freedom. Khan was born in the United Arab Emirates to Khizr and Ghazala Khan, was of Pakistani heritage, and was raised in Silver Spring, Maryland, United States. As a young child, Khan read extensively about Thomas Jefferson. In high school, he taught disabledchildren swimming. Khan graduated from John F. Kennedy High School in 2000, and the University of Virginia (U.Va.) in 2004. At U.Va., Khan joined the university&apos;s Army Reserve Officers&apos; Training Corps. Khan joined the United States Army to pay for law school, and had planned on becoming a military lawyer. In the Army, Khan achieved the rank of captain. In 2004, Khan was assigned to the Headquarters Company of the 201st Forward Support Battalion, 1st Infantry Division in Vilseck, Germany. Three to four months into his tour of duty in Iraq, on June 8 near Baqubah, Khan was inspecting a guard post when a suspicious taxicab began approaching too quickly. Ordering his subordinates away from the vehicle, Khan ran forward 10-15 steps and was killed by a suicide car bomb fitted with an improvised explosive device. The car detonated before it could reach the gates or the nearby mess hall where hundreds of soldiers were eating breakfast. The blast also killed the two occupants of the vehicle and two Iraqi bystanders. 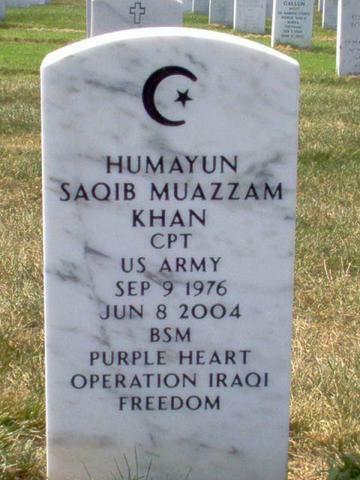 On June 15, Khan was buried at Arlington National Cemetery. Khan was also posthumously awarded the Bronze Star Medal and the Purple Heart. Tonight, we are honored to stand here as the parents of Capt.Humayun Khan, and as patriotic American Muslims with undivided loyalty to our country. Hillary Clinton was right when she called my son "the best of America." Donald Trump, you are asking Americans to trust you with our future. Let me ask you: Have you even read the U.S. Constitution? I will gladly lend you my copy. In this document, look for the words "liberty" and "equal protection of law." We can&apos;t solve our problems by building walls and sowing division. We employed more than 1,000 Iraqi citizens at Camp Warhorse. We were slowly making progress in the province, the economy and security was improving, and the insurgents were losing steam. Security at Camp Warhorse was extremely tight. Unfortunately, we had killed or wounded several innocent Iraqi drivers at our gates over the previous month for failing to heed our warning signs and our gate guards’ instructions. Each of these incidents potentially hurt our relationship with local Iraqis. Humayun had fostered a warm relationship with our local workforce, and he and his unit were determined to break the cycle of violence by reducing or eliminating unnecessary deaths and injuries at our gates. On the morning of June 8, 2004, the gate guards alerted Humayun to an orange-and-white taxi cab slowly moving through our serpentine barriers during the “rush hour” of Iraqi day workers coming onto camp. Humayun probably moved toward the suspicious vehicle to avoid killing the driver unnecessarily, but at some point, he concluded that something was wrong and ordered his men to hit the dirt. The driver detonated his car bomb, killing Humayun and two Iraqi citizens. Humayun died trying to save the lives of innocent Iraqis. His brave effort to approach the vehicle probably saved American lives as well. I raced to the gate upon hearing the huge explosion. It was an awful scene. Battalion commander Lt. Col. Dan Mitchell and his soldiers had resecured the destroyed gate, but we lost more than a gate, we lost a member of our team — of our family. Humayun’s death caused sadness throughout our entire brigade combat team. There were three different memorial services for him — one with our soldiers at Camp Warhorse, a second with our rear detachment and family members at our home base in Vilseck, Germany, and a third with the Khan family in United States. We named the 201st Battalion headquarters building on Camp Warhorse the Khan Building in his honor. And Humayun would hear this and step in. He would walk alongside him, a sentry staring the bullies down, deflecting them. And he intervened when Mr. Guerami was being roughed up outside the library. When he was punched in the throat in gym class and could not breathe. "He would meet in different circles members of the ROTC and they were his classmates and they would clearly see the difference in their discipline and their character, in their dealing with one another and that impressed him very much. He was a wonderful and deliberate person in his spirit. And he told us that he finds it very attractive that he would join ROTC. …doing things with honor and dignity." James P. Holzgrefe, who graduated with Khan in 2000 and served with him in ROTC, praised Khan for his abilities to build consensus and resolve conflict as a student at U.Va. — skills he applied in Iraq, where he established a jobs program to find work for Iraqis. The University of Virginia website reported that "while he was a student, Khan played intramural sports and volunteered at Madison House, which coordinates service to the community. A conference room at the Army ROTC headquarters is named in Khan’s memory. UVA also created the Capt. Humayun S. Khan Scholar-Soldier-Statesman Award to honor him." "He was always a peacemaker," Khizr Khan said, "always seeing an opportunity to give. He always said to the Iraqis, &apos;We&apos;re here not to hurt you but to help you.&apos;.... "
There were many who spoke English very badly, or with a lot of slang, but not him,” she said. “He spoke beautiful English and had a very beautiful voice....” In September 2003, Ms. Auer flew with Captain Khan to the United States to meet his father. This was serious stuff. Captain Khan loved to have a good debate with Ms. Auer, her family and her friends. One of his favorite topics was the meaning of life. "Dont go out and do something stupid. Don’t be a hero…. He told me &apos;mom, I have a responsibility that I can not deny. I have to be taking care of my soldiers because they depend on me.&apos; Still I would keep tell him, &apos;be safe, don’t become hero for me. Just be my son. Come back as a son.&apos; He came back as a hero." 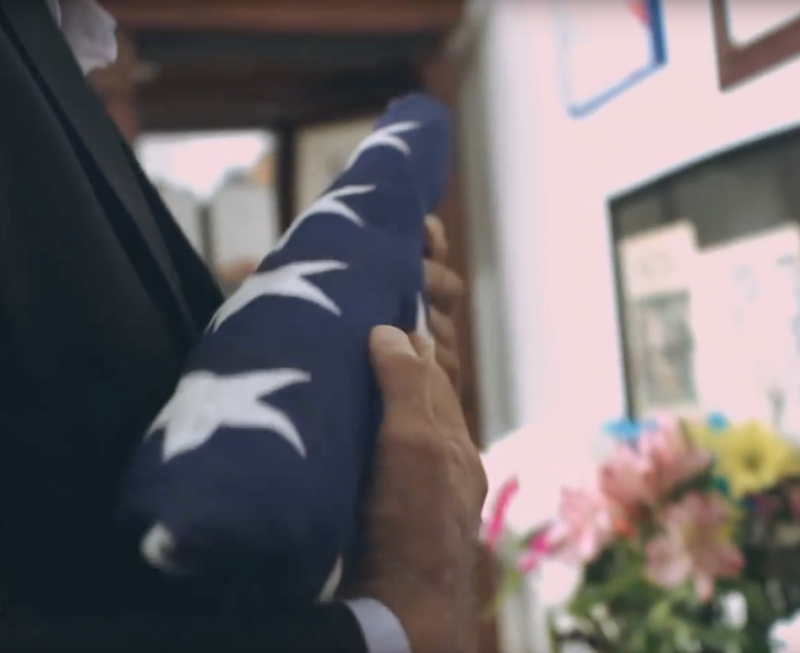 He was laid to rest with full military honors. 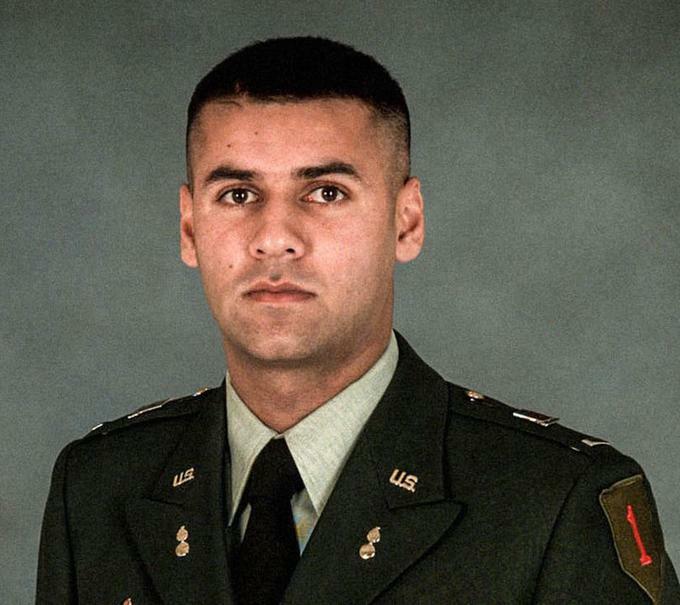 Captain Khan was a Pakistani American who served in the U.S. army as an ordnance officer, being the senior-most community member to die in Iraq. His colleagues and superiors remembered him for his courage, honesty, sense of humor and grace while in the field, even under pressure. Captain Khan&apos;s colleagues eulogized his exemplary services and praised him for the leadership he provided to his troops.